Our first “practice” session cooking rice in fresh bamboo poles turned out surprisingly well, earlier post here. So the next day, to celebrate the birthdays of three people in the office, we decided to have a lechon, some pinakbet, the experimental chicken tinola, a grilled eggplant salad, and several versions of bamboo rice so that everyone, and I mean everyone including workers helping us build a third lechonan, could enjoy a hearty lunch. The crew tried to outsmart themselves by wrapping the bamboo in foil, a move meant to prevent the bamboo from catching flame after some 30-40 minutes over coals, but this turned out to be a mistake. 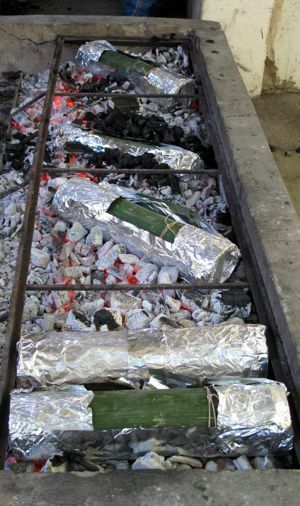 After 20 minutes, it was clear that the foil was getting in the way of attaining the highest heat within the bamboo to boil the rice, so we removed all the foil and put the bamboo directly on the coals. That’s what happens when you try to trump nature… Now we know better, and won’t use foil again. We made two versions of bamboo rice that day. The first a chicken and mushroom rice. Saute some chopped onion and garlic in vegetable oil, add ginger if you like, then the chicken, chopped red capsicum for color (definitely none of this in the jungle), and lots of chopped mushrooms, we used shiitakes, white and oyster mushrooms. We seasoned heavily with kikkoman soy sauce, some hoi sin sauce and added salt and cracked black pepper. Into each piece of bamboo, we added the rice, water and lots of the chicken mixture, putting it on the flames and cooking it for some 40-45 minutes on high heat. The results were very good, with the chicken and most of the flavoring remaining in the top half of the dish, seeping down towards the middle. The balance of flavors was better this time, and if there is one conclusion I can make, it is that restaurant versions of this cook their rice separately and they simply serve it in the bamboo vessels. Rice really cooked in the bamboo would not have a very well mixed consistency with ingredients that tend to float, etc. I wanted to add bamboo shoots to this dish, but couldn’t find any after scouring several groceries in Cebu. Bamboo shoots are in season in Manila these days, so they would make sense in this dish right now. First! I’m eyeing the bamboo in my backyard now thinking of what I can cook inside it – bamboo shoots in the rice? – funny. Like feeding a hamburger to a cow. Thanks for the post! O…M…G. I haven’t had a good authentic Asian dish in 1 year!!! I want to bite my monitor. Asa pako makahanap ng sisig dito. Kahit lechon kawali matutuwa na ako. that looks exactly like chicken kamameshi rice! i can almost smell it from here. MM, i sometimes see there’s a whitish, powdery film inside the bamboo..did you have to scrape that out? with all these bamboo posts (pun intended! ), am thinking of planting a whole grove in my backyard! I’m gonna try this chicken-mushroom rice cooked in bamboo when I go home to Ilocos. We have a lot of bamboo in our backyard so it will not be a problem experimenting with it…. it is also a beautiful and rustic presentation on the buffet table together with Filipino favorites. In Ilocos, we have this galapong-based dessert called tinubong (mixture is like the bibingka, vigan version, minus the egg), wherein it is cooked in bolos, one end cut off, the batter poured into it then sealed with coconut husk fibers. It is then grilled side by side (like a barbecue, 16-20″ above coals). During cooking time, they wipe the bolos one by one with damp cloth so it will prevent it from burning. Nawili ka na yata Marketman! Hope there’s bamboo left in your backyard. :) Seems like you’re getting the hang of cooking with a bamboo. Food looks fantastic! the first time i tried bamboo rice was in bistro remedios back when madonna was still hot. although i still go to that place once in a while for that bamboo rice, i start wondering if they just prepare the rice in some wok and then transplant them in the bamboo before serving. the pics above tell me maybe my suspicions are spot on. Hi! What is the proportions of water, rice and other ingredients that were put into the bamboo? I did not see in either posts what were the ratios you used. Also, what variety of rice was used, I suspect that if a harder rice like brown rice was used, more water will be needed or at least a soaking time, vs. white long grain rice vs. sticky Japanese type rice. Please also describe what was done to clean the Bamboo, especially the inside, since one of the commenters pointed out in the other bamboo post, that there may be some white powdery stuff / film inside. Thanks! Hi! I remember my teen age days adventure in the uplands of Davao Oriental. Back then I saw the first time, food was cook in bamboo. The mansaka( the native tribe in that province.) 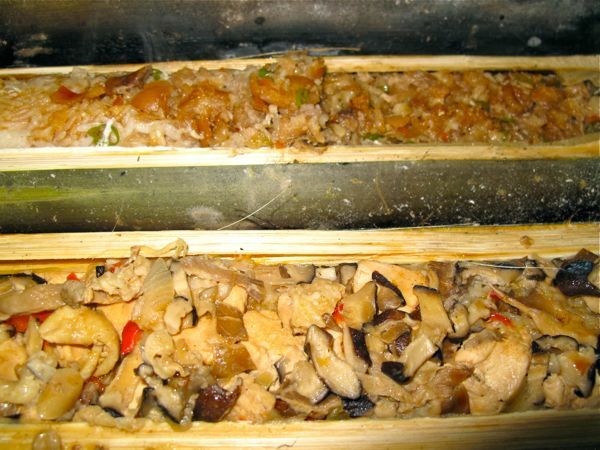 locally called it “Lurot” all dishes cooked in fresh bamboo. Such as Chicken, Pork, Rice and Game meats. The flavor was great and the hospitality of the tribe as well. I am happy and couldn’t believe that it is now introduce in the city. Just trying to imagine the flavors of food cooked in bamboo. Lovely post. Learning quite a lot about different cuisines. Am going to try out some recipes from your blog in my quest to learn more about Filipino food. :) Will be a regular at your space. Btw, lovely blog.